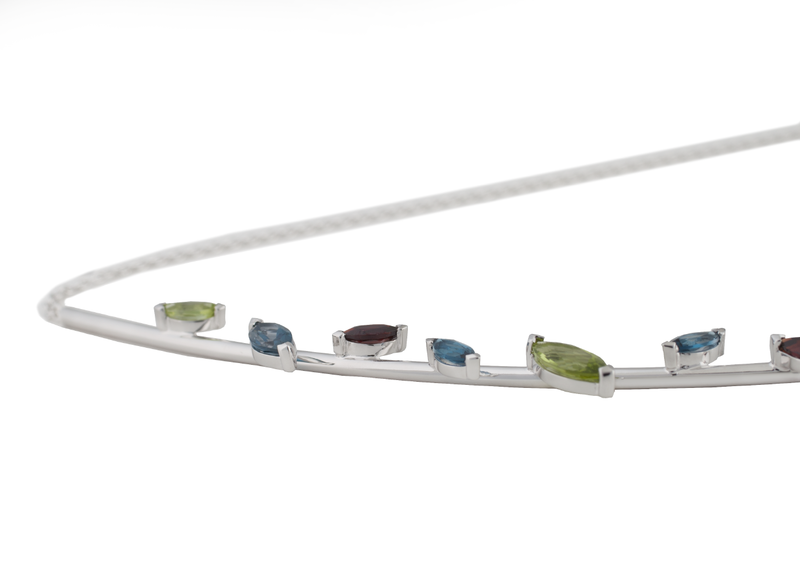 This design is part of the Twigs collection, which gives tribute to the shapes and diversity of nature. The necklace delicately rests along the collarbone to worship this intimate yet innocent part of the body. 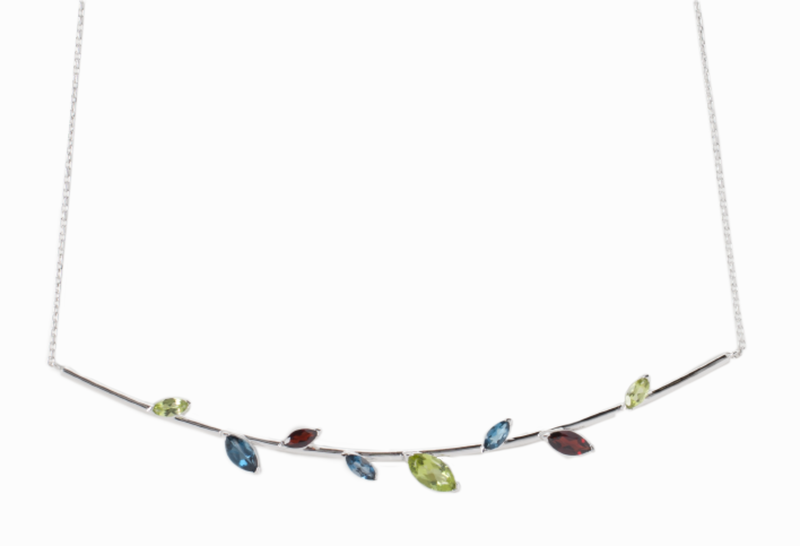 The elegant marquise shaped stones that represent the leaves are naturally placed all over the bended silver twig. The short necklace is perfect for casual and elegant styling, guaranteed to give day and evening looks a contemporary edge. 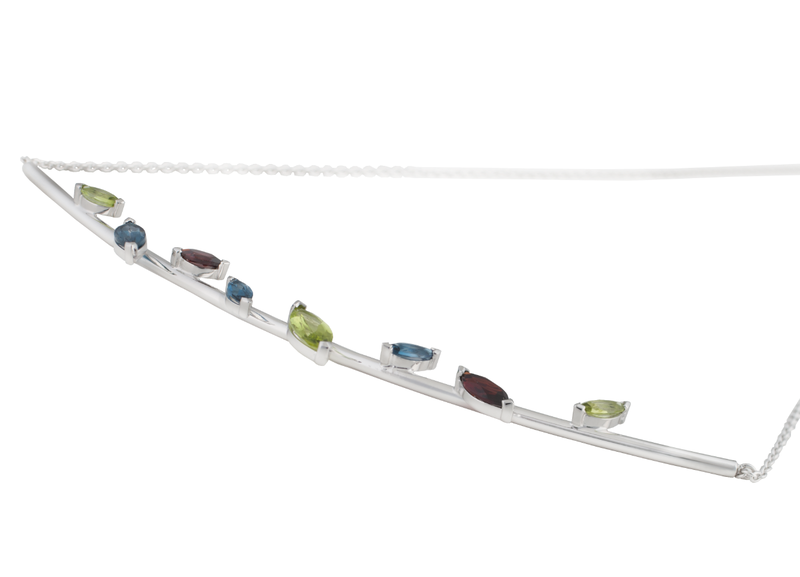 MATERIALS Chain and pendant: rhodanized Sterling Silver Stones: London blue topas, green olivine, red garnet MEASUREMENTS The necklace has a total length of 45cm It has an extension chain of additional 2cm length The pendant has a length of 11cm and a width of 2mm Stones in different sizes CARE The silver is rhodanized to protect it from oxidation, to keep the beautiful shine and make it more resilient against scratches. Anyhow, this delicate piece of jewelry is made of precious materials, which deserve a careful handling. Stones and silver should be protected against any kind of chemicals, including soaps. The jewelry should be stored seperately to prevent it from scratching, the best is to keep the jewelry in the original box after wearing.